This March, Latitude has onboarded a new partner Hydro. This is an open source blockchain project that aims to help new and existing companies to enhance application and document security, provides tools for identity management and transactions’ processing. The main goal of the project is to create standardized blockchain solutions, such as smart contracts and dApps, that can be used by companies all over the world. Sticking to the watery theme, Hydro aims to develop a set of protocols named by the same principle. The product line consists of five main items, two of which are already available for public use. This is the first Hydro’s product that is already up and running. It’s a blockchain-based authentication protocol which can be used by companies to enhance the security of sensitive financial and personal data. The Raindrop protocols can be leveraged by anyone wanting to create a secure authentication system. In fact, Hydro developer Hydrogen have done just that by creating an alternative to Google Authenticator, but with enhanced security provided by the blockchain technology. Also, unlike Google’s product, Hydrogens app allows you to regenerate your access to your favorite apps in case your phone is lost or stolen and is cross-compatible with multiple devices. This product is designed to enhance digital security further by managing digital identity on the blockchain in a safe and immutable way. It hasn’t been officially published yet, but is already available on GitHub. Ice is a document signing and verification protocol. It allows users to stamp, authenticate, verify and seal any document or contract on the blockchain without having to rely on centralized notaries. Such an approach helps not only to eliminate the risks associated with document tampering, but also speeds up the deal by reducing the complexity of documents’ verification. This product is currently at the development stage along with all those that are mentioned below. Tide is a payment protocol enabling one-click authorization of debit and credit POS transactions. It works both for business and personal uses. These are the last steps of Hydro’s current roadmap. These two products represent an artificial intelligence protocol and tokenization tool respectively and their release is planned for Q4 2019. Our company will not only provide the Hydro team with any possible assistance in promoting their products, but also become a pioneer in implementing Hydro’s services into our business model. First, we are going to enhance the security of our dashboard with the help of Hydro’s product Raindrop. 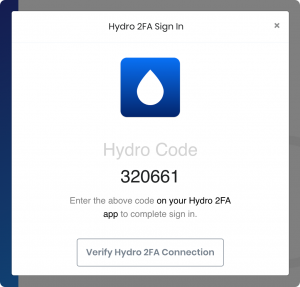 Hydro’s 2FA protocol will help us protect our users from malicious incidents. 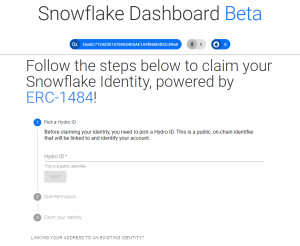 Also, we are going to be the first in line to test the beta version of Snowflake and implement the identity management tools for our clients and their users. Moreover, we are going to participate in the Hydro Community Affiliate Program (HCAP) in order to further propagate the new security technologies to businesses all over the world. All-in-all, this partnership promises to be quite beneficial for both our companies and help us develop our products and services further.